Bear With Me, a noire point-and-click adventure, will be released on Switch. Exordium Games announced the news today and nailed down a release window of Q2 2018. 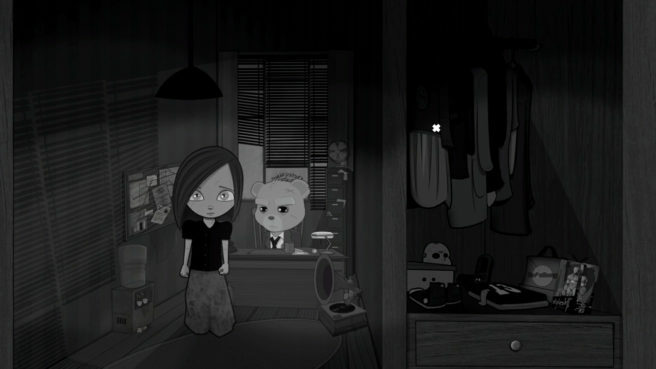 Bear With Me follows a 10 year-old girl and her imaginary friends as they investigate her brother’s disappearance. We have some additional information and a trailer below. Amber and her wise-cracking, chain-smoking companion, Ted E. Bear, will solve puzzles, search for clues and question suspects as they search for her lost sibling in the hand-drawn, monochromatic Paper City. Ted and Amber will interview a diverse cast of toys brought to life by the power of her imagination including the Mugshot Brothers, an infamous pair of toy rabbits that ended their one attempt at legitimate business by mugging their kid patrons. Many other bizarre and lovable residents await, spouting witty one-liners and pop culture puns. Bear With Me will come with all three episodes bundled as one on consoles. The adventure will feature full English voiceovers with French, German, Italian, Spanish and Russian subtitles.